Gap junctions are low-resistance channels which connect adjacent cells in almost all mammalian tissues, including blood vessels, allowing the direct transfer of electrical current and molecules of < 1 kDa in molecular weight. Because of their small size, many important metabolites and signaling molecules elicited by receptor activation, such as calcium, inositol trisphosphate, or cyclic AMP, would be expected to pass through gap junctions from one cell to another. Since arteriolar tone relies on the balance of vasoconstrictor and vasodilator pathways, which involve such signaling molecules or the opening of ion channels in the cell membrane and subsequent changes in membrane voltage, it is expected that gap junctions will play a pivotal role in coordinating this process. Gap junctions comprise a family of membrane proteins known as connexins (Cxs). Six individual Cx proteins oligomerize in the plasma membrane of one cell to form a connexon or hemichannel. A complete gap junctional channel linking adjacent cells results from the docking of two connexons, one from each of the two opposing cells (Figure 1). To date, 20 different types of mammalian Cx proteins, commonly named after their molecular weight in kilodaltons (kDa), have been identified. All of these Cxs have the same basic molecular structure, consisting of four a-helical membrane-spanning domains, two extracellular loops, and three cytoplasmic regions including one intracellular loop. 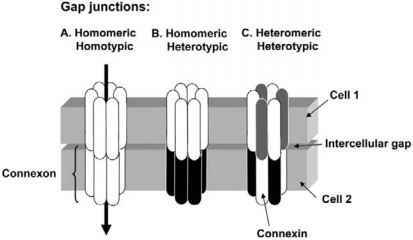 Gap junctional channels may be either homo- or het-eromeric in nature, depending on whether a single or multi ple types of Cxs are present in each connexon (Figure 1). Gap junctions can also be homo- or heterotypic depending on the Cx content of the two connexons (Figure 1). Gap junctional channels demonstrate unique electrical and biochemical properties depending on the constituent Cx isotypes. In turn, the distinct functional properties of each Cx protein arise from specific amino acid sequences found in the intracellular loop and carboxy terminus. The formation of heterotypic and heteromeric channels, which express a mixture of more than one Cx, has been shown to confer channel properties that are distinctly different from those of homotypic channels formed from each of the individual Cxs. For example, the ability to permit the passage of particular second messengers has been shown to vary with the Cx composition of gap junctions. Thus, it is important to determine the specific Cx composition of the gap junctional channels formed in any particular artery or arteriole, since this is likely to have a significant impact on vascular function. The function of gap junctions can be regulated by factors that act in either the short or long term. Short-term regulation is predominantly concerned with rapid and reversible changes in channel conductance resulting from alterations in the opening probability of the channels or alterations in channel turnover. On the other hand, long-term regulation of gap junctions involves alterations in gene expression at the mRNA and protein levels. In blood vessels, changes in Cx expression have been observed at branch points where blood flow is disturbed and shear stress turbulent. Such forces may also be expected to be encountered within the branching of resistance networks. Figure 1 Structure of gap junctional channels. Gap junctions comprise two connexons, each of six Cx proteins, which may be of the same or different types, in adjacent cells. Conductance of gap junctional channels can be modulated by a number of different factors, such as phosphorylation, changes in intracellular Ca2+ concentration and pH. The result of the phosphorylation of Cx proteins on conductance appears to depend on the component Cx isotypes and presumably relates to the number and location of specific phosphorylation sites, both of which vary among the different Cx proteins. Since many important vasoactive stimuli activate intracellular pathways resulting in increases in intracellular calcium or in the activation of protein kinases, it is likely that these stimuli will also modulate gap-junctional communication. Thus, cellular communication within the vascular wall may be dynamically controlled by increased or decreased channel open probability and gating, as well as Cx synthesis, assembly, trafficking, and degradation. The vascular wall is composed of a single inner layer of endothelial cells surrounded by layers of smooth muscle cells called the media (Figure 2). Both the endothelial and smooth muscle cells are spindle shaped but they are arranged with their longitudinal axes at right angles, the endothelial cells along the vessel axis and the smooth muscle cells transversely around the vessel (Figure 2). Large conduit arteries, such as the thoracic aorta, have many layers of smooth muscle cells that are interspersed with layers of elastic tissue to provide rigidity for the pressures experienced in these vessels. The so-called muscular arteries lack these elastic laminae, but still show considerable variation in the number of smooth muscle cell layers within the media. In the microcirculation, the number of smooth muscle cell layers is reduced to one or two. Figure 2 Anatomical structure of the arterial wall. Endothelial and smooth muscle cells are arranged at right angles to each other with adjacent cells being coupled by gap junctions. of the outer membrane leaflets of the two opposing cells is seen as a single dark line (Figure 3A). In some cases, a 2-nm gap can be seen at this point. Such gap junctions have been commonly identified between adjacent endothelial cells and, more occasionally, between adjacent smooth muscle cells as well as between the two cell layers. Figure 3 Gap junctions in the arterial wall. (A) Pentalaminar structure (arrows) of a gap junction connecting two endothelial cells of the rat basilar artery (kindly supplied by Dr. Shaun Sandow). Calibration bar 50 nm. (B) Cxs vary within the cell layers, as do the size of the gap junctional plaques. that different Cx isotypes may form channels with unique electrical and biochemical properties, the heterogeneity in Cx expression among different vessels may contribute to heterogeneity in vascular responses. In the vascular endothelium, Cxs 37, 40, and 43 have been commonly found in both large and small arteries. At the ultrastructural level, large areas of intact pentalaminar gap junctions, up to and sometimes larger than 1 mm in length, are readily found in vessels of all sizes, confirming the view that endothelial cells are well coupled throughout the vasculature (Figure 3A). At the light microscope level, using immunohistochemistry and subtype selective antibodies, gap junctions appear as puncta that delineate the cell borders of endothelial cells (Figure 4A,B). In the endothelium of many large vessels, Cxs 37, 40, and 43 have been described to be colocalized in the same gap junctional plaque, suggesting an ability to form heteromeric gap junctional channels. Although some variation in the relative expression of the three Cxs has been observed among different arteries, Cx40 appears to be the most highly expressed, whereas the expression of Cx43 may be the most variable in large vessels. Indeed, Cx43 appears to be specifically associated with areas where flow is turbulent, for example, at arterial branch points. Expression of Cxs is also subject to variation between species and in disease, development, and aging. In the small vessels of the microvasculature, as in the larger muscular arteries, expression of all three Cxs has been reported in the endothelium (Figure 3B). Once again, variability exists in the relative expression within and between vascular beds and in the same vessel in different species, although Cx40 still appears to be the most highly expressed of the endothelial Cxs, whereas Cx37 expression may be more variable in these smaller vessels. Thus, Cx37 was consistently found along with Cxs40 and 43 in the endothelium of mesenteric resistance arteries, but was absent from the arterioles of the rat mesentery. muscular arteries, however, demonstrated that expression of Cx43 was absent from the muscle layers of the latter vessels and that, even in the large conduit vessels, the expression of Cx43 decreased with distance from the heart. The development of Cx45 knockout mice provided the first anatomical evidence that this Cx may play a role in the media of murine arteries. Subsequently Cx45 was detected in the media of the thoracic aorta and caudal arteries of rats and in smaller cerebral vessels. Interestingly, expression of Cx45 was reported to be inversely correlated with that of Cx43 in the aorta, and the suggestion was made that these two Cxs may be associated with different states of cell activity and differentiation. Although reports of Cxs37 and 40 expression in the media of large arteries also exist in the literature, these have not always been confirmed and may have arisen through the use of incompletely characterized Cx antibodies or may constitute further examples of variation in expression across animal species. In muscular arteries, both large and small, there are few reports of the expression of Cx43. In general, Cx40 is also rarely described in the media of these vessels, although it is convincingly expressed in the renin-secreting smooth muscle cells of the juxtaglomerular apparatus. More recently, a role for Cxs37 and 45 has been identified in the media of a number of muscular arteries of rodents, including small microcirculatory cerebral vessels. The intensity and extent of the Cx staining within the media of muscular arteries and arterioles suggest that the incidence of gap-junctional channels may be less than that observed in the endothelium or in the media of conduit vessels. 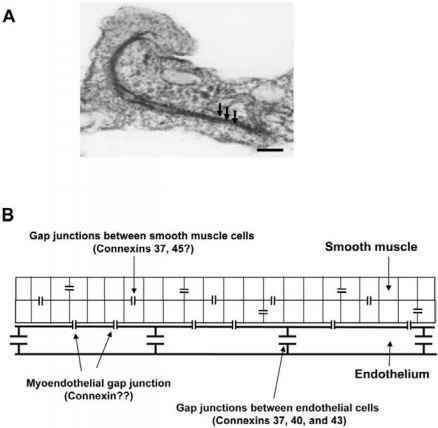 At the ultrastructural level, pentalaminar gap junctions between smooth muscle cells are rarely observed and, where described, are much smaller (~100nm) than those in the endothelium. Dyes, such as Lucifer yellow, that readily pass between endothelial cells do not pass between smooth muscle cells in arterioles of the microcirculation, again suggesting major differences between the coupling within the two cell layers. Interestingly, in larger muscular arteries such as the caudal artery, Lucifer yellow passes between smooth muscle cells in a radial but not a longitudinal direction, and nerve-evoked responses elicited in adventitial smooth muscle cells can be recorded in luminal smooth muscle cells. Taken together, these data suggest that coupling within the media of arteries and arterioles may be significantly less than that within the endothelium and may often be more effective in the radial compared with the longitudinal direction. Unlike homocellular coupling within the blood vessel wall, less is known regarding the nature of heterocellular coupling via myoendothelial gap junctions (MEGJs) between the endothelial and smooth muscle cell layers, and the Cxs comprising these junctions remain unidentified. Several studies have confirmed electrophysiologically that MEGJs exist in the microcirculation through the transfer of current pulses, dyes, and calcium from one cellular layer to the other. However, few structural reports of MEGJs existed in the literature until serial section electron microscopy was employed to elucidate their incidence. These latter studies have revealed that MEGJs are very small (~100 nm) and that in general the incidence of MEGJs increases as vessel size decreases. Thus, MEGJs might be expected to play an important role in the function of the microcirculation and in the control of vascular resistance. The maintenance of arteriolar tone is achieved through a balance between vasoconstriction and vasodilation. Alterations to this balance have been implicated in disease states such as hypertension and atherosclerosis. The myogenic response refers to the nerve- and endothe-lium-independent vasoconstriction in response to increased transmural pressure and vasodilation in response to reduced pressure. This autoregulatory response is considered to be a major determinant of vascular tone and to reduce downstream damage to microcirculatory elements from significant and sudden changes in systemic pressure. The myogenic response is more prominent in smaller vessels, but is also differentially effective among vascular beds. It is now well established that the myogenic response is initiated by depolarization of vascular smooth muscle cells and an increase in intracellular calcium concentration via the opening of voltage-dependent calcium channels. The involvement of gap junctions in this response is suggested from the attenuation of myogenic tone by putative inhibitors of gap junctions. Gap-junctional coupling among the smooth muscle cells would be expected to facilitate the spread of the depolarizing current to coordinate constriction, particularly if the pressure stimulus was insufficient to activate all the intramural muscle cells—for example, those more distant from the lumen. Thus, it may be predicted that gap junctions would be less important in the myogenic response of arteri-oles. Rhythmical contractions, or vasomotion have been demonstrated in many different vascular beds, including microcirculatory vessels of the systemic and cerebral circulations both in vivo and in vitro. 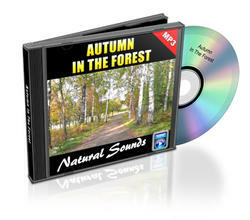 Vasomotion has been suggested to be important for the maintenance of vascular resistance and blood flow. The common underlying mechanism involves release of intracellular calcium, which initiates a depolarization of the cell membrane and subsequent oscillation in membrane voltage due to sequential opening and closing of calcium and potassium channels. Gap-junc-tional coupling has been suggested to be critical to coordinate these oscillations between adjacent smooth muscle cells, and putative gap-junction inhibitors have been shown to prevent vasomotion in a number of vascular beds. lation where the media is made up of only one or two cell layers. As its name suggests, EDHF produces a hyperpolariza-tion of the endothelium, followed by hyperpolarization and relaxation of the smooth muscle due to a reduced calcium influx through voltage-dependent calcium channels. The precise identity of EDHF is controversial, with chemical factors, which can diffuse from the endothelium to the smooth muscle, as well as simple electrical coupling of the two cell layers via MEGJs being proposed as the likely candidates. 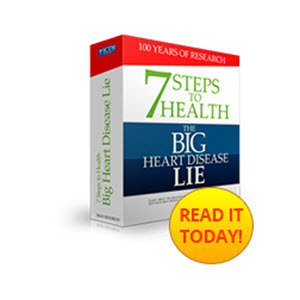 in general, the importance of No and EDHF are inversely related. Thus, No is more important in large arteries with multiple layers of smooth muscle, whereas EDHF has been found to be more important in smaller vessels with fewer smooth muscle cell layers. EDHF would therefore be seen to play a significant role in the microcirculation. Correlation of the incidence of MEGJs and the importance of EDHF as a vasodilatory factor has led to the suggestion that EDHF activity could be more simply explained by hetero-cellular coupling via MEGJs. Data from a number of laboratories, using putative gap-junctional uncouplers to inhibit EDHF activity and serial section electron microscopy to quantify MEGJs, have provided convincing support for this hypothesis in a variety of vessels, including the mesenteric microcirculation. Other studies have indicated that the myo-genic response is antagonized by EDHF, since they share a common target of calcium-dependent potassium channels, whose activity will reduce membrane potential and decrease the activity of the voltage-dependent calcium channels. An important function of the microcirculation is to regulate tissue perfusion by conducting vasodilatory responses from capillaries and small arterioles to upstream feed vessels to coordinate tissue blood flow to metabolic demands. Conducted vasoconstriction has also been reported in microvessels, and in the kidney this may be important for the operation of the tubuloglomerular feedback mechanism. 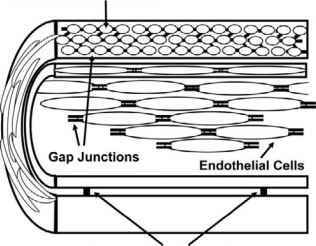 Conduction of vasomotor responses has been shown to rely on the electrotonic spread of current through gap-junctional channels within the vascular wall. selective disruption of the continuity of one or the other of the two cellular layers has confirmed that the endothelium is the principal site for conduction of vasodilation, although in some vessels vasodilatory responses can be conducted in the smooth muscle if the endothelial pathway is impaired. on the other hand, vasoconstrictor responses are conducted in the smooth muscle and not in the endothelium in some vessels, whereas in others these responses are not conducted along the vessel at all. These data are in line with the immunohistochemical results suggesting that coupling between smooth muscle cells along the length of arteries may be less effective than coupling within the endothelium. Acetylcholine evokes a conducted vasodilation that appears to be mediated by EDHF, whereas No, prostaglandins, and EDHF are all thought to modulate vasodilation at the local site of drug application. MEGJs are therefore considered to play an important role at the distal site in order for the hyperpolarization to be transferred to the smooth muscle and effect a relaxation through the inact-ivation of voltage-dependent calcium channels. The reduced conduction of endothelium-dependent vasodilatory responses in the skeletal microcirculation of mice lacking Cx40 further highlights the importance of endothelial gap junctions in these responses. The preceding discussion has indicated that gap junctions play an important role in microvascular functions that can affect arteriolar tone and, in turn, systemic pressure and effective tissue perfusion. Since these functions are often compromised during vascular disease, such as hypertension, diabetes, and atherosclerosis, it may be expected that changes in expression of particular Cxs will accompany these states. 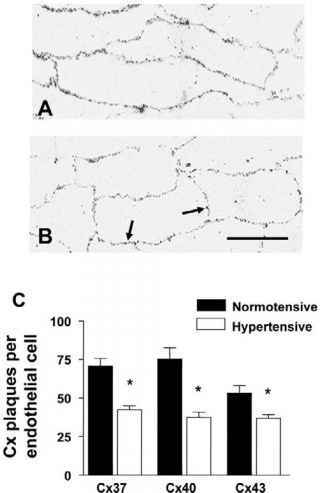 Indeed, mice lacking Cx40 are hypertensive, while changes in expression of Cxs have been reported in the endothelium of large arteries in hypertensive animals (Figure 4). Increases in Cx43 have also been described early in the formation of atherosclerotic lesions, suggesting that upregulation of Cx43 may be required for the initial smooth muscle cell proliferation, while inflammatory mediators appear to modulate Cx expression and compromise conduction of microvascular responses. Taken together, these data point to gap junctions as potential therapeutic targets for the treatment of cardiovascular diseases. More precise data regarding the control of gap-junctional function in intact tissues, the distribution of particular Cx isoforms in different parts of the microcirculation, and changes during disease will shed further light on the feasibility of this proposal. Conduction: Propagation of physiological responses to distal sites within the vasculature. Cxs: Protein components of gap-junctional channels. Endothelium-derived hyperpolarizing factor (EDHF): Putative factor producing endothelial hyperpolarization and relaxation of smooth muscle. Gap junction: Intercellular channel connecting the cytoplasm of adjacent cells, allowing the transfer of electrical current and small ions. Myoendothelial gap junction: Gap junction connecting endothelial and smooth muscle cells. Myogenic response: Nerve- and endothelium-independent vasoconstriction in response to increased transmural pressure and vasodilation in response to reduced blood pressure. Vasomotion: Rhythmical contractions of a blood vessel. Christ, G. J., Spray, D. C., el-Sabban, M., Moore, L. K., and Brink, P. R. (1996). Gap junctions in vascular tissues. Evaluating the role of intercellular communication in the modulation of vasomotor tone. Circ. Res. 79, 631-646. Comprehensive review identifying the importance of gap junctions in the physiology of vascular responses. Davis, M. J., and Hill, M. A. (1999). Signaling mechanisms underlying the vascular myogenic response. Physiol. Rev. 79, 387-423. de Wit, C., Roos, F., Bolz, S.-S., Kirchhof, S., Krüger, O., Willecke, K., and Pohl, U. (2000). Impaired conduction of vasodilation along arterioles in connexin 40-deficient mice. Circ. Res. 86, 649-655. First study to demonstrate a role for a specific connexin in the conduction of vasodilatory responses in the vascular wall of microcirculatory vessels. Hill, C. E., Phillips, J. K., and Sandow, S. L. (2001). Heterogeneous control of blood flow amongst different vascular beds. Med. Res. Rev. 21, 1-60. Hong, T., and Hill, C. E. (1998). Restricted expression ofthe gap junctional protein connexin 43 in the arterial system of the rat. J. Anat. 193, 583-593. Demonstration that Cx43 is absent from the media of muscular arteries. Sandow, S. L., and Hill, C. E. (2000). The incidence of myoendothelial gap junctions in the proximal and distal mesenteric arteries of the rat is suggestive of a role in EDHF-mediated responses. Circ. Res. 86, 341-346. First study to correlate the incidence of MEGJs with the role of EDHF in vasodilatory responses. Segal, S. S., Emerson, G. G., and Bartlett, I. S. (2000). Endothelium and smooth muscle pathways for conduction along resistance microvessels. In: EDHF 2000 (P. M. Vanhoutte, ed.). London: Taylor & Francis. Severs, N. J. (1999). Cardiovascular disease. In: Novartis Foundation Symposium, Vol. 219, Gap Junction-Mediated Intercellular Signaling in Health and Disease (N. B. Giluda, ed. ), pp. 188-211. New York: Wiley. First to question the nonspecificity of many connexin antibodies. Willecke, K., Eiberger, J., Degen, J., Eckardt, D., Romualdi, A., Guldenagel, M., Deutsch, U., and Sohl, G. (2002). Structural and functional diversity of connexin genes in the mouse and human genome. Biol. Chem. 383, 725-737. Dr Nicole Rummery completed her Ph.D. on the expression of vascular Cxs in arteries from normotensive and hypertensive rats under the supervision of Professor Caryl Hill, who heads the Blood Vessel laboratory at the John Curtin School of Medical Research. Research in the laboratory is focused on the involvement of gap junctions in vascular function, particularly the role played in vasomotion and in the mechanism of action of EDHF. 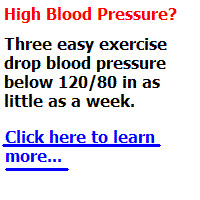 Work is supported by the National Health & Medical Research Council and the National Heart Foundation of Australia.